When Mary Ann Evans was seven years old, her elder sister Chrissie was lent a copy of Waverley. Unfortunately, the book had to be returned before Mary Ann had finished reading it: this distressed her greatly, and she began to write out the story herself. In the summer of 1871, at the time of Scott's centenary, Marian (as she now called herself) wrote to Alexander Main that she worshipped Scott, tracing her first reading back to when she was seven years old and saying how she had read Scott to her father, thus comforting his last years. She added 'No other writer would serve as a substitute for Scott and my life at that time would have been much more difficult without him. It is a personal grief - a heart wound to me when I hear a depreciating or slighting word about Scott'.2 It is clear that he was the writer who first fired her imagination as a child and remained, indeed, an inspiration and influence throughout her life. 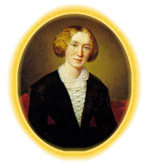 During her first year at the Misses Franklin's school in Coventry (she was then thirteen) Mary Ann read Bulwer Lytton's Devereux and probably much of Scott, who was writing until his death in 1832. Later, in her early twenties, she wrote rather pompously to her friend and early mentor, Maria Lewis, about Scott's life as depicted by his biographer Lockhart that 'all biography is interesting and instructive. Sir Walter Scott himself is the best commentary on the effect of romances and novels. He sacrificed almost his integrity for the sake of acting out the character of the Scotch Laird, which he had so often depicted'. She became more radical when she moved to Coventry with her father and met Charles and Cara Bray. Their influence brought about a marked change in her ideas: at one point they took her to visit the Waverley country, while among the interesting people she met at their home was James Simpson, an old friend of Scott's and a champion of free elementary education. Scott's father had been a 'high and dry' Calvinist, but his son 'early put behind him Calvinism and all that it implied, he disliked the intense preoccupation of a man with his own soul which imported evangelicalism from England and detested the new industrialism'.